NEW DELHI: Real estate investment in India’s six major cities doubled to $2.87 billion in the year ended June 2017 as Mumbai attracted maximum capital and was ranked 81st globally, according to Cushman & Wakefield report. “India received a total real estate investment of $2.87 billion in the six cities – Mumbai, Bengaluru, Pune, Delhi-NCR, Chennai and Hyderabad – which was an increase of 100 per cent,” the property consultant said. These six cities were able to attract capital because of strong economic drivers, acceleration in reforms, high yields and rapidly modernising business base. “Mumbai recorded real estate investments of $1,749 million, placing it on 81st position in global survey ranking cities by their success at attracting capital,” C&W said. Mumbai was ranked 149th out of about 400 metros globally in the last year ranking. Out of the total real estate investment received by six cities, the report said the largest share of over 55 per cent came in from North America. Funds from Europe contributed about 14 per cent, while domestic and regional sources saw a decline in share of capital invested in India. “Current economic drivers are biased towards developed markets, but Indian cities are performing ahead of expectations and are clearly offering superior medium to long term growth potential in real estate,” said Anshul Jain, Country Head & Managing Director, India Cushman & Wakefield. Jain said that although established markets of Mumbai, Bengaluru and Delhi NCR have seen the larger share of capital investments, cities such as Chennai, Hyderabad and Pune are also key destinations being manufacturing hub for automobiles, engineering goods, white goods, pharmaceutical products, etc. The country’s current economic position and political stability have been instrumental in creating better investment environment, the consultant said, adding that the positive changes in the legislative environment has ensured that the invested capital is safeguarded. According to the report, Mumbai was placed number one by growth amongst the gateways cities with a 194 per cent rise from the previous year. Only Pune outshines Mumbai in terms of investment growth at 285 per cent. The report ‘Winning in Growth Cities’ that surveys over 400 global locations, also places Bengaluru at 161 position with total real estate investment volume of $461 million. “The global property investment market saw volumes rise 4 per cent year-on-year to $1.5 trillion in a one year period ending June 2017. The rise compared to the previous 12 months reflects improving sentiment in 2017,” C&W said. New York ($51 billion) remained the top city in the survey followed by Los Angeles ($39 billion) and San Francisco ($32 billion). In Asia, Hong Kong (global rank 8) received the highest volume of investment at $18.4 billion. WASHINGTON: The issue of bringing real estate under the GST’s ambit will be discussed next month, Finance Minister Arun Jaitley said today, as he acknowledged that it is the one sector where maximum amount of tax evasion and cash generation takes place. The matter will be discussed in the next meeting of the GST Council to be held on November 9+ in Guwahati, Jaitley said while delivering the ‘Annual Mahindra Lecture’ on India’s tax reforms at the prestigious Harvard University. “The one sector in India where maximum amount of tax evasion and cash generation takes place and which is still outside the GST is real estate+ . Some of the states have been pressing for it. I personally believe that there is a strong case to bring real estate into the GST,” Jaitley said. The Goods and Services Tax (GST) was implemented from July 1 this year. It brings the economy under a uniform tax regime. “In the next meeting itself, we are addressing one of the problem areas or at least (having) discussion (on) it. Some states want, some do not. There are two views. Therefore, by discussion, we would try to reach one view,” he said. The move would benefit the consumers who will only have to pay one “final tax” on the whole product, Jaitley said. “As a result, the final tax paid on the whole product in the GST would almost be negligible,” the minister said. Jaitley said the reduction in eventual expenditure coupled with incentivising people to enter the tax net may also help reduce the size of “shadow economy”. On demonetisation, Jaitley said it was a “fundamental reform” which was necessary to transform India into a more tax-compliant society. “If you see the long-term impact of it, demonetisation brought in more digitised transactions; it brought the issue to the centerstage. It expanded the individual tax base. It compressed the cash currency by three per cent which was operating in the market. “Those objectives are for the long-term. No doubt there are short-term challenges, but (necessary) for transforming India from a non-compliant to a more compliant society,” he said. The finance minister said India had historically been one of the least efficient tax system in the world with an extremely small tax base. “Frankly, over the last several decades, serious efforts, real efforts to expand this base had not been made. You had marginal efforts,” he said, adding that systematic efforts to challenge the “shadow economy” were made only recently. “In the last few years, the bulk of the increase in tax payers has not been in terms of number of companies but individuals who are coming into the tax net,” he said. Jaitley said some people had “misunderstood” the objective of demonetisation “which wasn’t to confiscate somebody’s currency”. “Obviously if somebody has currency and deposits in the bank, it does not become lawful holding. They still have to account for it. Therefore, the anonymity which was attached to a cash currency came to an end and that holding got identified. “The government was able to trace out about 1.8 million people whose deposits are disproportionate to their normal incomes. And they are all answerable to the law and pay their taxes,” he said. Jaitley is on a week-long stay in the US, during which he will participate in annual meetings of the IMFand the World Bank. The Indian real estate market is expected to touch $180 billion by 2020. 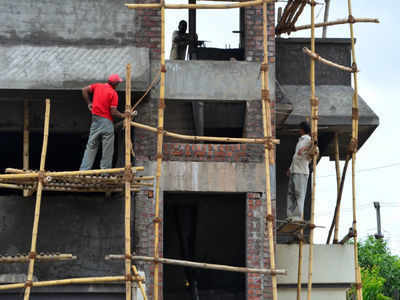 The housing sector alone contributes 5-6 per cent to the country’s Gross Domestic Product (GDP), according to India Brand Equity Foundation, a Trust established by the Department of Commerce, Ministry of Commerce and Industry.